Waiting for the weekend can be tedious and seem to last an eternity. 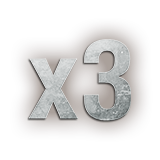 Why not take the edge off the midweek monotony with a nice XP bonus? To make the wait a bit more bearable. Get in the right mood before the weekend comes, Roll out!